I wasn’t sure I was going to like Nichijou. Gag manga aren’t really my thing, even when created by mangaka whose other works I enjoy. However, the back cover promised character growth and a take on the school genre that it was “just surreal enough,” so that compelled me to give it a shot. The manga so far focuses on a handful of students who begin with pretty much a single defining trait. Nano Shinonome is a robot who mistakenly believes she’s kept this fact a secret from her classmates. Yuuko Aioi is described as “cheerful,” and proves to be fond of really bad jokes and prone to forgetting to do her homework. Mio Naganohara is “normal,” but might secretly be a BL fangirl. Mai Minakami is “quiet,” but also seems to enjoy pushing Yuuko’s buttons. There are a few other characters too, like the rich boy and the girl who likes to blow him up, but they don’t factor in as much. While I can’t say that any of the gags in these two volumes made me laugh, they did make me smile quite often. Rather than the jokes themselves, I think what I like the best was how Arawi-sensei depicted them. He’s got great comic timing, and just the way the panels are laid out makes things funnier. There’s one moment, for example, where Yuuko realizes she has left the homework she actually bothered to do at home, so we get her anguished cry of “Damn it!” depicted from three different angels in the same panel. I also loved it when the “camera” panned to the side to show someone else reacting to what’s happening with the main characters, and there’s also a fantastic nonverbal chapter about building a house of cards. My favorite moments in these two volumes, however, involve animals. The one character whom I actually kind of hate so far is “the professor,” the eight-year-old who created Nano and who refuses to remove the wind-up key that Nano is so desperate to get rid of. But in volume two, they take in Sakamoto-san, a talking cat (thanks to a bandana the professor created) who tries his best to be dignified but who can’t resist giving in to his kitty instincts. I also adore the canine whom I have dubbed “solidarity dog,” a pooch who shows up a couple of times when Yuuko has been exiled to the hallway and places a silent paw of commiseration upon her. There’s a great 4-koma relating to him, too. 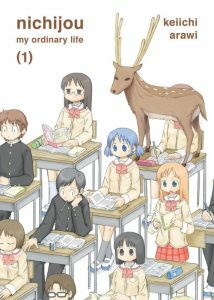 All in all, I enjoyed Nichijou, and I look forward to the next volume! 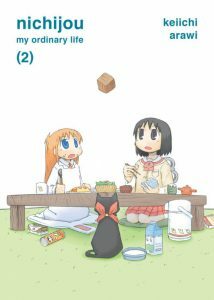 Nichijou is complete in ten volumes. Vertical will release volume three in July 2016.